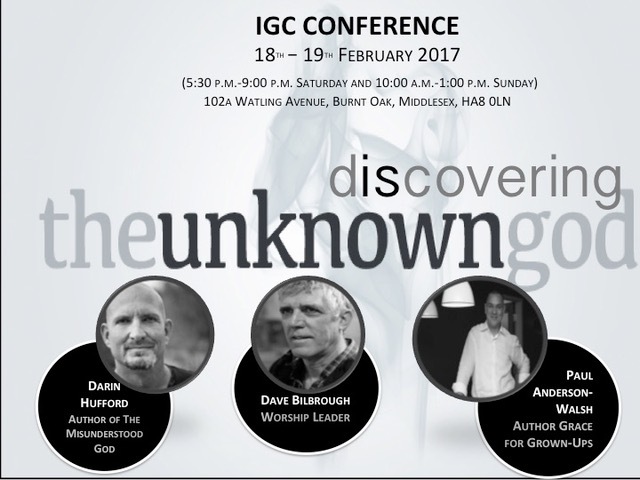 Over the weekend of Saturday 18th and Sunday 19th February 2017, IGC will be hosting the “Discovering the Unknown God” Conference. We are pleased to have Darin Hufford and Paul Anderson-Walsh leading the teaching along with Dave Bilbrough providing the worship. We previously welcomed Darin Hufford back in 2015 at the Awe & Grace Conference (Recordings available here) and thrilled to welcome him back for another opportunity to enter deeper into the mystery of oneness through teaching, worship and connection. The schedule for the weekend is outlined below and if you’re on Facebook, please sign-up for the event and share it with others you think may be interested in attending.